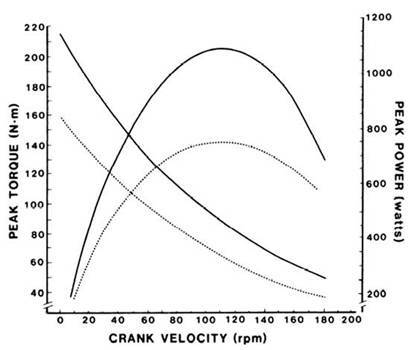 Based on the contractile properties of human muscle it has been shown that maximal cycling power output is achieved at approximately 120-130rpm (Figure 2; 8, 50, 51, 62, 78). Such high cadences may be important to maximal sprint cycling performance. Indeed, track and bicycle motorcross (BMX) cyclists typically perform short duration events (?m) at average cadences equal to or greater than 120 rpm 19, 20. However, Zoladz et al. 78 found that when pedalling above 100rpm there was a decrease in the power output delivered at any given oxygen cost, which was in turn associated with an earlier onset of anaerobiosis 77, 78. Such findings highlight the disadvantage of adopting such high cadences (>100rpm) during prolonged high-intensity exercise, such as competitive road cycling. This entry was posted in Reviews, Training and tagged Cadence, Crank Torque, Cycling Endurance exercise engineering Fatigue Profiling Heart Rate Monthly Testing Protocol Orthostatic Heart Rates Power sports and exercise engineering sports engineering Sports Exercise Engineerin, exercise engineering, exercise prescription, Power, Training, TT, VO2 Max, Watts. Bookmark the permalink.